Tom Williamson Motorsport took one of their biggest ever teams of twenty-six drivers to the second round of the Australian Kart Championship at Newcastle over the weekend. With competitors in over eight classes at the championships a round win and two podium finishes for the round was the highlights of the weekend. 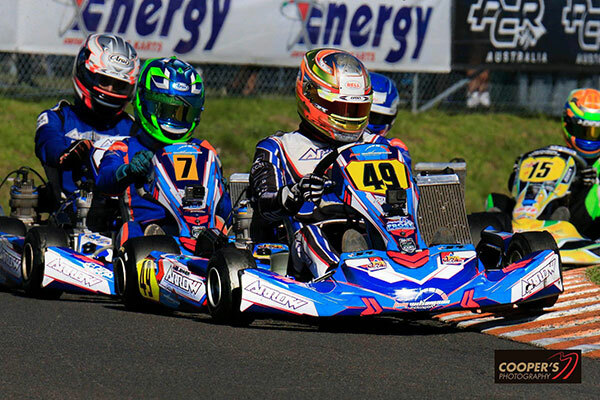 James Anagnostiadis was again the star of the show in the Cadet 9 class taking another Australian Kart Title round win. Anagnostiadis ran top five all weekend and had heat win in heat 3 but in the final the young charger jumped to the lead and never looked back taking a light to flag victory giving himself another round win and in a strong championship position for the rest of the season. X30 Light had eight TWM representatives for the weekend with round 1 winner Brad Jenner again leading the charge. Jenner after winning the opening round was able to come home with another podium finish in third spot keeping a strong championship position. 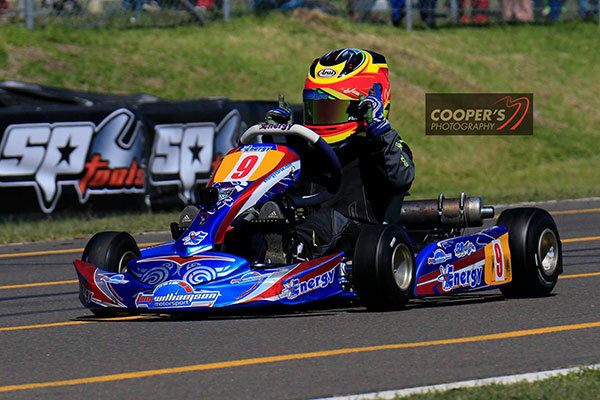 Jaiden Pope put in another solid weekend coming home in the top five in position five with defending Australian champion Cody Gillis having a bad weekend in the heats making a fight back in the final for a strong top ten finish in seventh. Cameron Longmore and Marc Tulloch just missed the top ten coming home in position eleven and thirteen respectively gaining good points for their championship credentials. Angus Wallace and Jordi Marcon both finished outside the top twenty in position twenty-four and twenty-six effectively with Theodore Livanes striking trouble and not finishing the final. In KA2 Junior TWM had both Fletcher Harris and Beau Pronesti were in the battle for the win and the podium in the final. Harris was leading and looked a likely winner before an unfortunate incident cost Harris victory and took him out of contention in the final. Pronesti was able to battle on until the end of the final coming home on the podium in second spot. Matthew Hillyer also had a strong weekend coming home with a top five finish in the final in fifth spot to help his championship points. Conner Roberts was in an unfortunate first lap incident that ruined his race coming home with a DNF finish in the final. In KA4 Junior Cody Maynes Rutty was the best of the TWM drivers right in the thick of the battle for the lead and looking a chance to take it to the leaders coming from as low as seventh. Maynes Rutty fought on well and just missed the podium in position four in a strong result. Joel Strode was as high as fourth at one stage but had an incident and dropped to the back end of the top ten and recovered to come home inside the top ten in a strong position eight. Jack Childs had a tough final battling outside the top twenty coming home in position twenty-seven in the final. 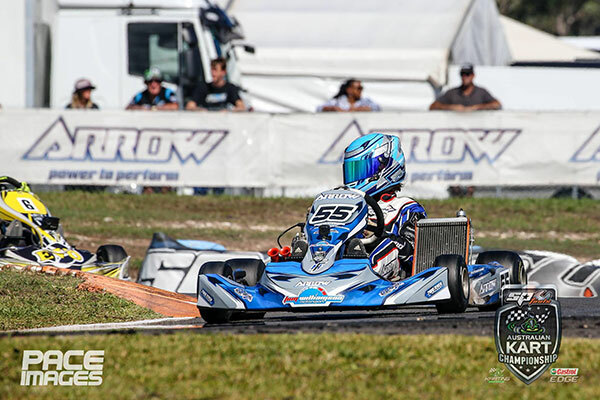 KZ2 had three drivers representing the TWM team in Kye Cavedon, former national champion Jac Preston and lady racer Tayla Agius. All three drivers had things go wrong throughout the weekend making for a tough final for all drivers. Cavedon was the best of the three drivers coming home just outside the top ten in position thirteen. Preston and Agius both struck trouble in the final with Preston going to the rear of the field recovering to come home in position seventeen with Agius having a DNF not turning a lap in the final. Tag 125 had representatives Zachary Heard, Brayden Taylor and Elly Morrow for the TWM team all looking for strong finals. Heard was the best of the three drivers coming home with a strong top ten result. After running as high as seventh Heard came home in position nine. Taylor started in position twenty-four but charged his way up the field just outside the top fifteen in position sixteen with Morrow striking trouble in the opening few laps resulting in a DNF. TWM final four drivers Josh Buchan and Victoria Lopes in KA3 Senior and Leon and Lewis Cordato in Cadet 12 had mixed results in their finals. Buchan was the best of the senior drivers coming home inside the top twenty in the oversubscribed KA3 senior with Lopes coming home outside the top thirty in an improvement from his starting position. Leon Cordato also came home in the top twenty in his oversubscribed Cadet 12 final in position eighteen. Unfortunately, Lewis Cordato was unable to make the oversubscribed final after a tough weekend. TWM owner Tom Williamson was happy overall but new the team had work to do to be back up as high as he would like them to be. “Great win by James this kid is really going places” noted Williamson. “Great result again by Brad Jenner and Beau Pronesti but some bad luck for Fletcher and Cody cost us some more good results. We have work to do and we will come back next round in Monarto as strong as possible”. TWM will be next out on circuit for the next round of the Rotax Pro Tour in Ipswich.